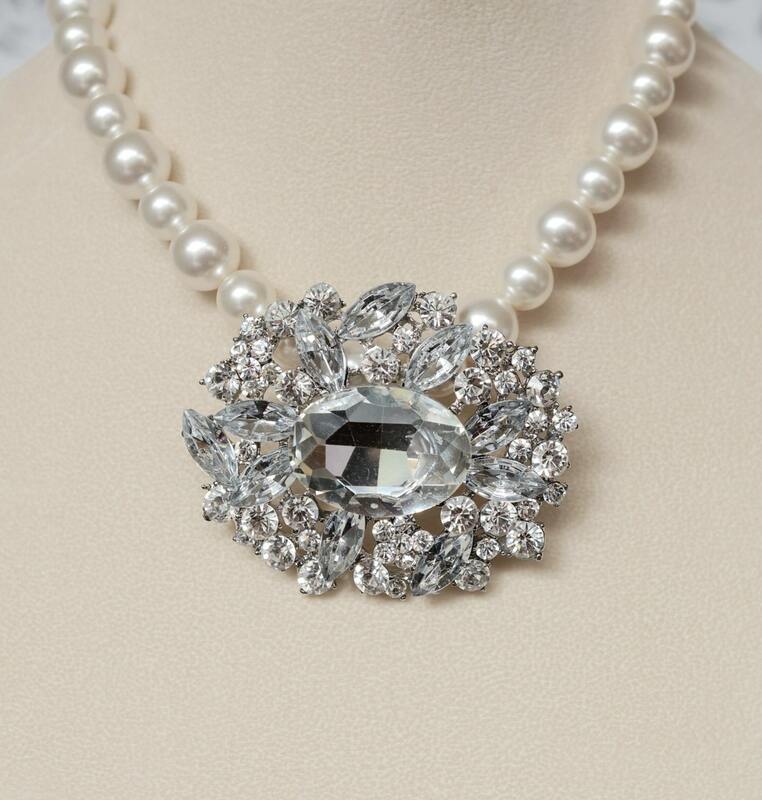 Here you have a statement bridal necklace made with an impressive repurposed rhinestone brooch. It measures 2.5 inches x 2 inches. 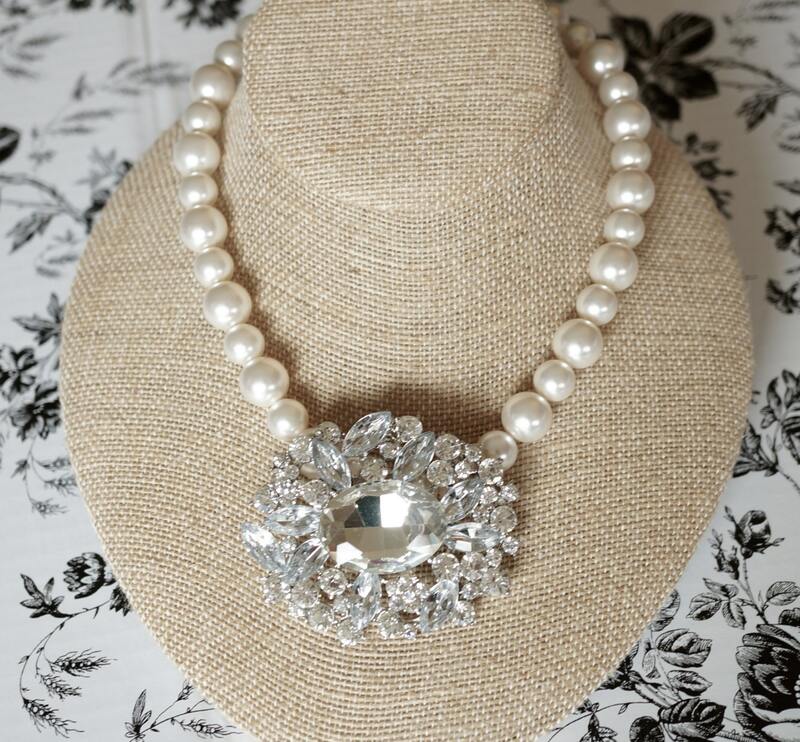 The necklace part is composed of white Swarovski pearls, 10mm and 12mm. 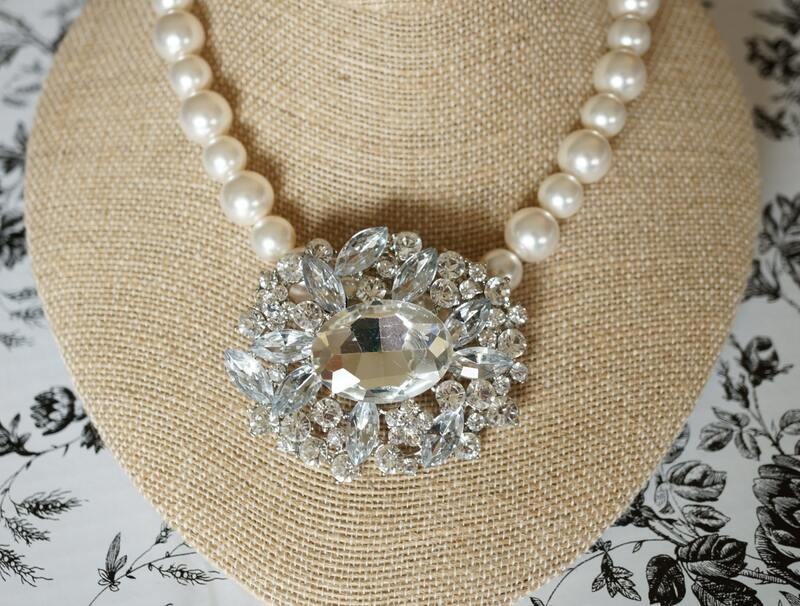 The necklace comes together with an oval rhinestone magnetic clasp. The necklace measures 16.5 inches. This necklace can be shortened for an additional $10. It can be lengthened for an additional $15. Please contact me before ordering if you need any of these adjustments. Please know that this necklace is a one of a kind piece. I do not repeat the exact designs. You will be the only one to own it! Nobody else. That is what makes my jewelry so exclusive. I have signed up for ETSY'S DIRECT CHECKOUT. Etsy’s Direct Checkout service allows you to use various forms of payment on Etsy’s website, mobile apps and other services. I accept payment by Paypal, credit card, debit card, Etsy gift card, Apple Pay, and Google Wallet. You are expected to make payment within 5 days from the date of purchase. I will send you a reminder on day 3. If you need an extension of that time, please contact me. Otherwise,if you have not paid during that 5 day period, I will notify you that your order has been canceled, and that I will re-list that item. I use the USPS shipping services. - Priority Mail envelopes and boxes Delivery time is between 1-3 days, not guaranteed. - Priority Mail Express is more expensive, and delivery is between 1-2 days. IS MORE EXPENSIVE. Both include trcking update and delivery confirmation. *****INTERNATIONAL BUYERS ARE RESPONSIBLE FOR ANY CHARGES FOR CUSTOMS DUTIES, TAXES, AND PROCESSING FEES THAT MAY BE INCURRED IN YOUR COUNTRY. I WOULD ADVISE YOU TO FIND OUT THOSE ADDED COSTS BEFORE COMMITTING TO THE PURCHASE. I accept DOMESTIC RETURNS that are made within 14 days after your item was delivered. Please contact me if there is a problem with your purchase. You will be responsible for the cost of the shipment of the returned item. It has to be returned in the same kind of packaging that I sent it in: box or padded envelope. IT MUST BE INSURED! It has to be returned in the same condition that I sent it to you. If it gets lost, and was not insured, I will not give you a refund. Once I get the returned item, and upon inspection, I will refund you the cost of the item/s, not your shipping cost. I DO NOT ACCEPT INTERNATIONAL RETURNS. I WILL ONLY REFUND YOU IF A PACKAGE GOT LOST. IF THE TRACKING SHOWS THAT IT WAS DELIVERED, I WILL NOT REFUND YOU. To avoid the need to return, please take a good look at pictures, read the descriptions, and compare the measurements with your measurements. Do not go by the size number. In the descriptions I will also disclose if there are any defects. Keep all this in mind in order to make an informed decision on your purchase.